Feathered theropods have some issues. A lot of people just don´t like them. Movies like „Jurassic World“ have also shown that the mere idea of theropods being mainly covered in some sort of feathers or filaments is still far away from getting general acceptance. One of the reasons for this, and probably an especially important one concerning the movie industry, is the fact that many people find the image of a theropod with feathers instead of scaly skin just not scary enough. For some reason feathers are often automatically mentally connected with such little frightening birds like chickens, what usually results into a massive downgrading of respect. And that´s what often gets stuck in the minds of people, phrases like „T-rex was just a giant chicken“. What those people completely forget, is that domestic chickens make up only a tiny fraction of the more than 10.600 species of modern birds, and that they are obviously not the best comparison for large to giant predatory theropods. People should really stop to think about chickens when they think about big feathered dinosaurs, but more about birds of prey, vultures and other modern carnivorous birds. Some of them are really awe-inspiring and aggressive carnivores, and there is obviously a reason why birds of prey – eagles in particular – gained so much respect in so many cultures around the world. One reason why feathered theropods are not exactly popular in the general public is also perhaps due to their common depictions. A lot of the early and still often used illustrations show just something that looks like a dinosaurs with fuzzy feathers glued on parts of their skin. This actually looks often rather goofy. Sadly it´s especially that kind of depiction which is most widespread in the medias, thanks to certain poorly animated theropods in various documentaries. Luckily things have started to change, and more and more illustrations are now out there, which show much more realistic and visually appealing attempts to visualize feathered theropods. Some of them look really fantastic, and I am especially fond of the beautyful restaurations by John Conway. But again, we face here the constant complainers who don´t want to see feathered theropods, because they look in their views not awesome and badass enough, what often even results into open sketisms about the very existence of feathers in many theropods, despite the overwhelming fossil evidence which emered over the last years. But to cling on scaly theropods just because they allegedly look more badass than those with feathers makes about as much sense as to hug the outdated idea that vikings really wore horned helmets and double-axes because someone thinks they look more awesome. Perhaps one way to counter this problem could be to show those people that even feathered theropods actually could have looked really nasty. Nature can be extremely cruel, and we are often not used to see all those cruelty and nauseousnes which is part of the natural life. Even many nature documentaries often don´t show the most brutal and disturbing scenes. We also forget often very quickly that even familiar animals which we know from zoos and which we find cute and beautyful, can be also highly dangerous and deadly as well. The same polar bear which looked before like a huge teddy bear is suddenly no more that cute at all, when it´s all over covered with blood or feasting on mangled carcasses. It´s the same with big cats, as beautyful as they are, they are still among the most dangerous predators of the world, which sometimes still consider our own species as nothing but prey. Their beauty is also quickly gone, when you see them dripped wet with blood, and their resemblance to an oversized housecat easily vanishes when you see photos like this, and I hardly doubt much people would be eager to pet this blood-covered cubs anymore. Sometimes the beauty can be a beast, and even a beast can be beautyful. 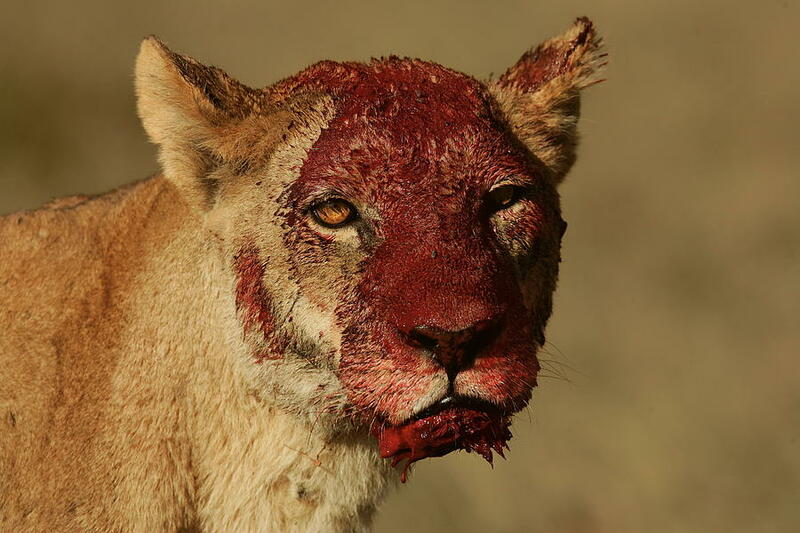 Even the majestic lion doesn´t look much more adorable than a komodo dragon defleshing a blood-oozing whale carcass, when its mane is soaked with blood. And this doesn´t only apply to mammals and reptiles, but to birds as well. If you look at those modern birds like marabous, vultures or giant petrels which feed either on large prey or on carcasses, you can get an idea how it could have looked when theropods were feeding on entrails, gobbling bones, or literally bathing in blood. Things like this doubtlessly happened on occasion, when theropods were feeding on larger prey which was too big to be eaten whole. And I really don´t think that the presence of feathers makes them lesser scary, in fact, I would even say that blood-soaked plumage looks even more gory than blood on scales. Just take a look at this awesome giant petrel, splashed with the fresh blood of a dead fur seal, or this incredibly badass fighting giant petrels with all of their beaks and heads stained red. And if you have a strong stomach, take a look at this video of a giant petrel disembowelling a penguin alive and feeding with an accomplice on the living flesh of the fleeing victim. With all this in mind, remember that a giant petrel is just the size of a goose, with short legs and waddle feet, unarmed wings with feathers and a toothless beak. Now try to imagine one of the larger theropods, surpassing every lion or bear in size, with meat-hook-like claws on its arms, long muscular legs and which would outrun every human with ease and with jaws full of sharp-edged teeth, ripping the bowels out of its prey, the whole jaws and head stained red and blood soaking into its feathery filaments with sanguine drops running down its neck. Would this still look lame? My artistic abilities are only quite limited, and I have sadly not much experience with brushes and paint, but some time ago I made a try with water colours on cardboard to depict the dromaeosaurid Tsaagan from the late Cretaceous of Mongolia in a style which should now feel familiar to you. I deliberately chose a pretty small theropod, which comes in its overall head shape at least vaguely close to a giant petrel. 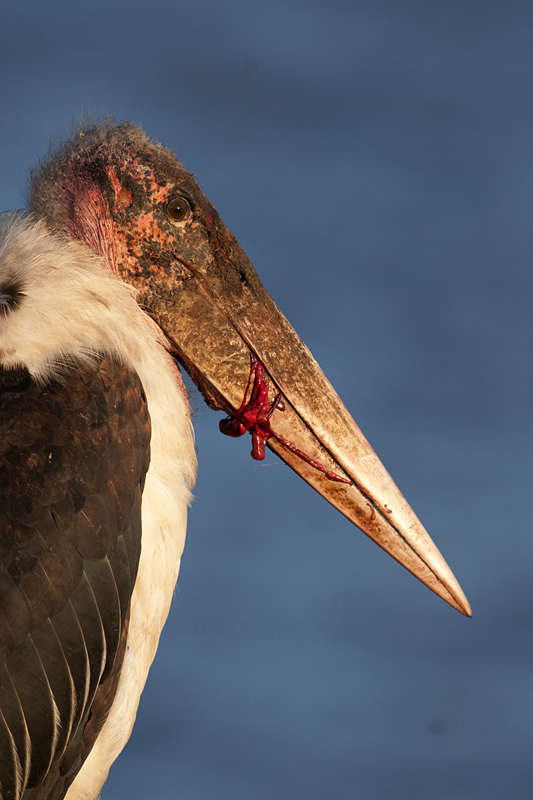 I also covered much of the teeth with lips and gave its plumage some volume. 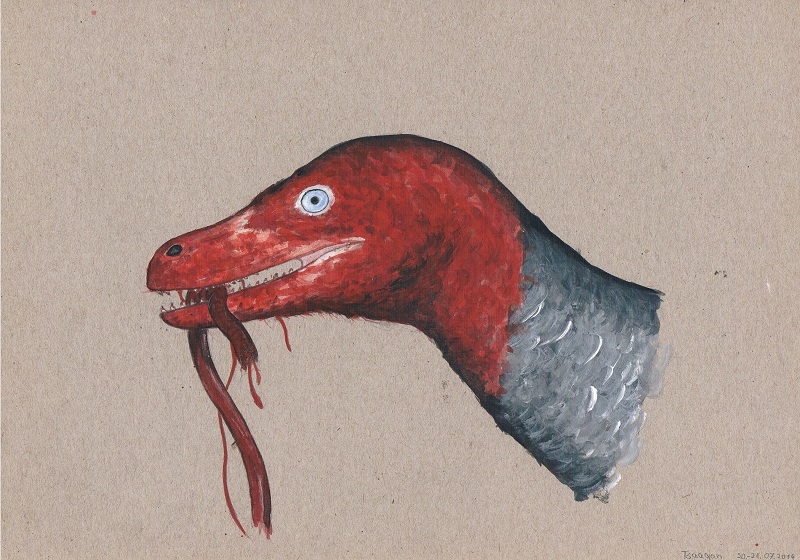 Perhaps I can encourage with this blogpost some artists who are more skilled than myself to include some blood and guts at least on occasion into their paleoart, to show that feathered theropods could have been also badass and scary, and as a reminder that nature always had its brutal and gory sides. Dieser Beitrag wurde unter Dinosaurier, Paläontologie, Populäre Irrtümer, Vögel veröffentlicht. Setze ein Lesezeichen auf den Permalink.